Every two years, the Indiana State Library hosts the Indiana Library Leadership Academy program for up-and-coming librarians in the field. Librarians across the state, and from a variety of library backgrounds, apply to attend INLLA. Each librarian is chosen based on the responses and project proposals submitted with their application. The participants selected, along with their coaches, spend four days learning about the qualities of leadership and, specifically, how those leadership qualities translate to the library profession. During the most recent INLLA, facilitator and author Cathy Hakala-Ausperk, of Libraries Thrive Consulting, contributed her expertise by sharing aspects of her library experience and talking about what it takes to be a leader. Beginning with the four-day retreat, INLLA is a two-year commitment culminating in the completion of the projects that the participants designed to improve, enhance or strengthen some aspect of their library or community. Pictured are Erin Cataldi, Stacey Kern and Raenell Smith at the Kwame Alexander author event held at Clark Pleasant Middle School. INLLA participant Erin Cataldi, teen and adult reference librarian at the Clark Pleasant branch of the Johnson County Public Library, wanted to increase teen engagement in her library. She realized that reaching teenagers in a mostly residential community can be hard and that there aren’t a lot of spaces for them to congregate and hang out. She wanted to improve the teen “space” in the library to become more inviting and to be used by its intended audience – teens. One of Erin’s innovative programs: a Harry Potter escape room at Clark Pleasant branch. Erin wanted to begin this process by offering more innovative programming to get the teens used to coming in to the library. She also wanted to revamp the teen space to make it more appealing to teens. Her approach was to work with local businesses and organizations to offer ongoing passive programs at all times in the teen space. She also decided that working more closely with the local schools to promote the library would be a good way to let teens know that the library is a safe place to meet up, hang out, study and create. Currently, Erin doesn’t have control over the teen space due to the size of the existing building, but a recent announcement conveyed that by 2020 the library should be breaking ground to build a bigger branch. The proposed plan includes a generous teen area for materials and activities. So, the future is bright! Erin Cataldi and Annie Sullivan at the Whiteland Community High School author event. By volunteering to help out at school events, such as an author visit by Annie Sullivan, Erin continued to solidify her already established relationships with the local middle and high schools, which gives the students a closer connection to the library. Monthly makerspace at Clark Pleasant Middle School. Additionally, Erin operates a monthly makerspace at Clark Pleasant Middle School and regularly drops off program brochures, library card applications and posters to the schools around the county. She is also launching a teen advisory board this month in order to gather input into programming ideas for teens. She also attended a young adult round table to talk about best practices for teen programming and to get ideas to supplement what she is doing at their branch. Erin is an example of a library leader who is having an impact on her library and on her community. This process began with INLLA and the project that she created to increase teen engagement in her area. With the idea of increasing teen engagement, Erin has developed a closer relationship with the schools by volunteering at their events and making more school visits. Teens at the Clark Pleasant Branch of the Johnson County Public Library are lucky to have Erin on their side and I can’t wait to see what she does next! This blog post was written by Kara Cleveland, Professional Development Office supervisor at the Indiana State Library. When you go to build something or make repairs, you grab a toolkit, right? Toolkits have the basic tools you need to accomplish your goal: Repairing or building things! When you need resources about management, leadership or both, where do you look? Library? Work? Friends? Now you can go into your Leadership Toolkit! This toolkit gives you the tools to help you become the best leader you can be. The toolkit is the culmination of a project from the Indiana Library Leadership Academy (INLLA). 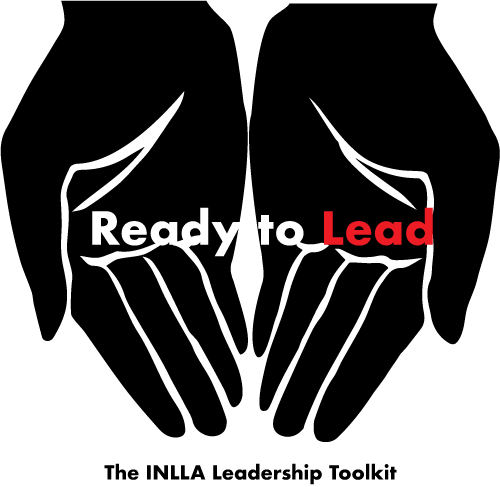 The Toolkit is free and contains resources such as books, articles and videos about leadership and how to improve or supplement current leadership skills. Have other ideas and resources that should go into the toolkit? Contact us and let us know. We can all lead from where we are; position or title is not a requirement for the toolkit. We look forward to see the growth of leaders in the Indiana library community! It’s time to build.